Can you tell us more about your role and what you do on a daily basis I work as a Concierge, so I provide information to the guests – directions, recommendations, anything they may need assistance with. How long have you been in the industry? About three years and counting. 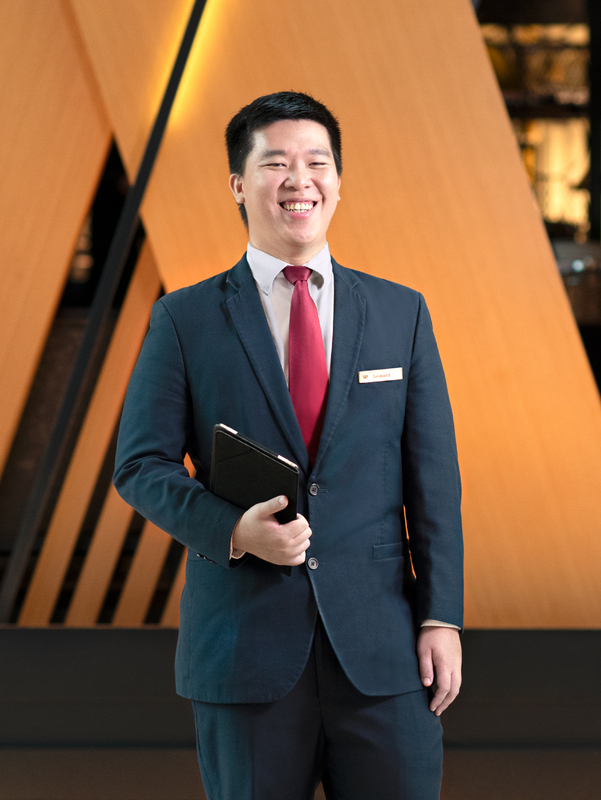 I studied Hospitality and Tourism at Temasek Polytechnic and after my internship, I continued working in the hotel industry. I’ve tried multiple roles in a hotel, but I chose to work as a Concierge because I thought it would be interesting. What inspired you to join the hotel industry? My parents were avid travellers, so when I was younger, they would take me to different countries. We stayed in hotels whenever we travelled, and I was fascinated by how a hotel was able to run 24 hours a day, 365 days a year. This interest drove me to find out more about hospitality, which was why I enrolled in a hospitality course in school. I also have a long-term goal of running my own backpacking hostel or resort one day; I want to learn more about the industry so I can achieve that goal. What are some of the things that you enjoy most about what you do? The opportunity to interact with guests from different countries and cultures. But most importantly, being able to help them with any issues or challenges they may face during their stay with us. All these experiences help me learn something new and grow my knowledge about the wider hospitality industry. How do you think you’ve grown since you joined the hotel industry? I’ve definitely grown in my knowledge and skills over the years. I also think I’ve grown to be more patient and not to rush things. My communication skills have definitely improved. I’ve learned how to speak with different guests, and also to listen better. What has been your most memorable experience in your career thus far? I once helped an elderly German couple relive their honeymoon in Singapore from over 20 years ago. They had their old itinerary laminated, and they wanted to revisit the same places. However, some of the places no longer existed, so I helped to craft an itinerary that was as similar as possible to their original one, and also recommended some new attractions they could visit to make new memories together. And I did it all within a couple of hours! I was glad to be able to give those guests a special experience. You also once helped a family locate a relative’s grave. Can you tell us about that? This elderly couple used to live in Singapore, and their son had passed away during World War II. He was buried at Kranji War Memorial, and they used to visit his grave quite regularly. However, they moved back to Australia in the 1990s and lost track of where their son was buried. So recently, one of their relatives was staying with us and told me that the couple wanted to place some flowers at the grave, but they didn’t know where it was. All she had was a name, date of birth, and the inscription on the headstone. With that limited information, I spent a few hours checking the database and finally found the headstone that matched those details exactly. However, the next challenge I faced was finding a florist who could deliver the flowers to the grave. Not many were willing to do that, so I had to call quite a few until I finally found one who was able to place some white lilies on the grave. I’m glad I was able to help the family. They wrote an email after they had checked out to express their appreciation for what I had done. Why do you choose to go the extra mile to help guests with such requests? I want to create unforgettable experiences for my guests. I see it as a challenge for myself. So I make it a point to do everything I can to help them, no matter how big or small their request may be. As a Concierge, I usually get a lot of requests from guests, but it’s not very often that I get such unique and meaningful ones. At the end of the day, if I’m able to help a guest with something, I do feel a sense of fulfilment and accomplishment. What advice would you share with someone who is interested in joining the hotel industry? Always do things from the heart. Because when you genuinely want to create happiness for your guests, everything you do will be worth it – no matter how tough or challenging the job may seem.